Charles P. has won five Get of Sire classes, and placed second in the other two classes entered in 2009. We are not disappointed with the cria that Charles P. is producing, they are getting better with each birth. They all have that "eye catching" appeal, with very typey huacaya heads, and in all colors. We are also pleased to announce that many of his offspring are winning their own blue ribbons and banners. Come See For Yourself! You only have to take one look at his face and you fall in love with this herd sire. Charles has it all: long staple, wonderful hand, excellent conformation and bite, brightness and personality. If that isn't enough, take a look at his genetics! Another Quetzal offspring with full coverage, Quetzal's outstanding head, and outstanding fleece. The 2011 cria continue to be "eye catching"! We have started breeding Charles to gray and again, not disappointed. When bred to a MSG, he produced a DSG Female who is STUNNING! 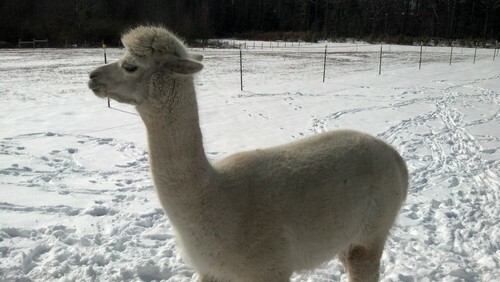 Charles P. is co-owned with Whistler's Glen Alpacas. Edith is a full peruvian, experienced mom who has produced two female cria and one male cria while at Coffee Pot Farm. Isabella, her 2007 daughter, placed 2nd at the New York Alpaca Show. Isabella is everything a foundation female should be with excellent bone structure and conformation and a regal bearing. Her sire, Charles P Atlas, has produced some very nice show animals and Isabella is no exception. Izzy has the bloodlines of Quetzel, Timoteo, Matador and 6PAtocha's Gold. Isabella has proven to be an excellent mother and produced two of the animals on our farm, both of which have her very nice demeanor and posess the excellent density, crimp and desirable micron she exhibits in her own fleece. She is easy to do herd health with, yet she prefers to be off with her group of female friends. Isabella's appeal is the ability to breed her to light or dark males due to her white, fawn, and black ancestry. 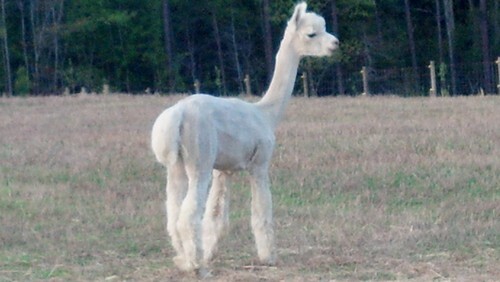 On our farm, her cria reflected the color of the sire. She is a really, really super foundation female. She tends to bring out the best of the sires' characteristics while adding density and crimp. I am looking for the right guy, and if I can find him, she will be bred this spring. 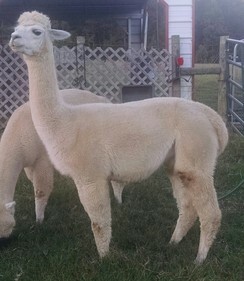 Two of her offspring each won first place in their halter class at the 2017 Carolina Alpaca Celebration.